If The Owner is Shomer Shabbos, is There a Need for a Mashgiach? It happened this way. 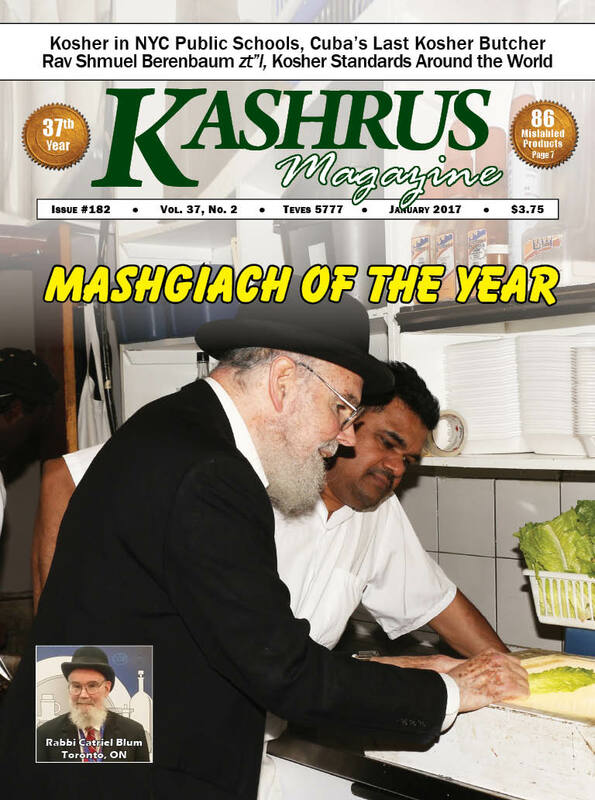 A call came into the KASHRUS Magazine office from a respected rabbi in Brooklyn. I decided to find out whether indeed there is no mashgiach being used and why not. It certainly seemed to me that not having a mashgiach, even if the caterer were Shomer Shabbos, is not the standard of the kashrus industry today. So, I called the kashrus administrator of the certifying agency and here is what he said. “It is true that we have no mashgiach on site at this caterer. It’s a small operation. We rely on the caterer who is heimish. “Also, we send down our mashgiach every day for a spot-check of the facility. And, you should know that this is the standard of heimishe Brooklyn kashrus agencies: for a small caterer or restaurant operated by a heimishe yid, if there is no checking of vegetables, there is no on-site mashgiach required. Spots checks are made regularly (either daily or weekly). For larger operations there is an on-site mashgiach. I had to find out the facts before I proceeded. Is this indeed the standard of the industry—no mashgiach for a restaurant that is Shomer Shabbos owned restaurant or caterer? If so, then we have not progressed so far in all these years. I remember, a few decades ago, when we pressured the Brooklyn restaurants and caterers to take on hashgacha and we discouraged consumers from going to any establishment which did not have hashgacha. But now, if we do not have an on-site mashgiach and the kosher agency visits once a week or even once a day, do we really have protection for the consumer? The Web(be) Rebbe, Orthodox Union Kashruth Division (“OU”): Thank you for contacting the “OU”. “OU” policy on food service establishments, restaurants, caterers, hospitals, hotels, nursing homes, yeshivas, etc., requires a mashgiach temidi (the owner himself does not count) who is the only one with the keys to the kitchen or the refrigerators. When the night mashgiach leaves the premises, all the cooking equipment is sealed so as to prevent any cooking from taking place, without the mashgiach present. The mashgiach turns on all fires regardless of whether there is a pilot light or not. We are do not rely on a pilot light. It is a bidieved (after the fact) backup only. All vegetables that require bedikah are checked by the mashgiach. All incoming deliveries are checked by the mashgiach before anything is put away. All meats used in “OU” facilities are “OU” Glatt only. In addition to a mashgiach temidi, there is someone who goes around to all the facilities on a regular basis, to ensure that all “OU” policies are being enforced by the mashgiach. Also, there is a mashgiach manual created for the mashgiach in food service to be followed by every mashgiach. Rabbi Yehoshua Kaufman, Badatz Chug Chsam Sofer—Bnai Brak: [Translated from the Hebrew]: In those establishments under our supervision, we do not rely on an owner for matters of kashrus, even if the owner is a Shomer Torah Umitzvos. We do, however, rely on him for lighting the fires to make the food bishul yisroel. For restaurants, we tailor the supervision to the establishment. Basically, we have a mashgiach who represents our standards and we have a roving mashgiach who comes regularly as needed, usually twice a day. Rabbi Schlomo Hofmeister, Community Rabbi of Vienna, Austria: We allow other official rabbis also to do their own hashgacha in Vienna (Rabbis Schwartz, Aminov, Hotoveli, and Weiss), but as far as my own standards are concerned these are they. Always, milchig as well as fleishig establishments operate with an independent shomer [mashgiach] on the premises, at all times. The owner has no key to the kitchen himself, no matter whether he is chareidi Jew or a non-Jew. Rabbi Nissim Hilu, One Kosher International, Tecamachalco, Mexico: All my restaurants and caters have one or two mashgichim on site, even if the owner is Shomer Shabbos. Besides the mashgiach on site, we have three mashgichim to check the restaurants and caterers and to be on top of the on site mashgichim. In addition, we installed (and paid by our Vaad for) a video camera in each kitchen to be monitored from the office. In the meat restaurants and caterers we use only Beth Joseph meat and bishul yisroel according to the Beth Joseph. In dairy restaurants we have both cholov yisroel and regular milk. Rabbi William Goldberg, Ohio K: We work on a case by case basis. Dairy restaurants/caterers generally require a weekly visit to a Shomer Shabbos on-premises owner. For meat we require a mashgiach tamidi, except in rare cases when we would require only twice weekly visits with a Shomer Shabbos owner on-premises. Rabbi Moshe D. Gutnick, Kashrut Authority of Australia & New Zealand, Senior Dayan - Sydney Beth Din: 1. We require a mashgiach temidi at every meat establishment regardless of size and regardless of frumkeit of the owner. The mashgiach is always paid by us, not by the owner. We sometimes allow the caterer or shopkeeper to operate without a mashgiach temidi provided all meat is either sealed with our seals or locked in a fridge with a security lock provided by us. If he wants to handle unsecured meat in any way - there must be a mashgiach. There are no exceptions to this rule. 2. When a caterer is catering at various venues, there must be a mashgiach temidi for everything: milk, meat, or pareve. This also includes Shabbos and Yom Tov, and even at shuls. We do not rely on even the local Rav, as he invariably has no idea what to look out for or is too busy running the tefilos. 3. A caterer at base will be allowed to do limited pareve or dairy preparation without a mashgiach temidi. 4. We do not require a mashgiach temidi for a milk or pareve shop. 5. If the owner wants to serve both cholov yisroel and not cholov yisroel and he himself does not keep cholov yisroel, we will require a mashgiach temidi or a sign is put up that we do not take responsibility for the cholov yisroel. We tell the customers that they must check what they are being served at the time. Practically speaking, this only takes place at a coffee shop, where the milk for the coffee may be either cholov yisroel or cholov stam. One place has such a sign. Another place serves only cholov yisroel. 6. If the shop is only cholov yisroel, we do not require a mashgiach temidi. 7. In all cases where there is no mashgiach temidi, a yotsai v'nichnas goes in at the beginning of the day, lights all the fires and checks the vegetables that are needed for that day. We make a risk assessment on each place to determine any additional yotsai vnichnas visits. Different places have different routines. Of course the reasons why we insist on a mashgiach temidi by meat and not by dairy are that 1) we are dealing with Torah laws versus rabbinic ones, and 2) the cost differential between kosher and non kosher meat compared to kosher and non kosher dairy (mainly cheese) . I know there are a lot of hashgochos which allow meat establishments without a mashgiach or have exceptions to the rule for one type of shop or for different hours, but I simply cannot understand it. The temptation is far too great. I have been to such places where officially a Shomer Shabbos owner is relied upon, but he is nowhere to be found. All I saw were non-Jews running the place, so I stopped eating there. I am very much not a fanatic, and I don't impose my personal standards on others, but, over the years, I have come to stop eating meat at any place where I don't see the mashgiach on site even with a normally reliable hechsher. They talk about cost, but every establishment needs a worker. And the mashgiach can be a “working” mashgiach. That can mitigate the cost. Note that even in places where we have a working mashgiach we pay him. To read more responses, click "Buy this issue now" or "Subscribe" at the bottom of this page. Every shul has it’s own cast of players, with some very interesting ones to be found in the mix. But, you would still have to look pretty far and wide to find someone like our Mr. S., the gem of our shul. You see, Mr. S. has recently turned 100 years old. Despite his age, you will find Mr. S. at every minyan (shacharis, mincha, and maariv), and, he comes to shul on his own two feet. Oh, so he uses a cane a little bit, but, he is walking under his own power; there are no mechanical or electric devices being used, and no aide. One look at Mr. S. and you would be convinced that he has lived a charmed life throughout all his days. His smile is absolutely captivating, his sense of humor is so pervasive, and his demeanor is so very enviable. But, when you sit near Mr. S., you can’t miss seeing the numbers that are tattooed on his arm, his own personal reminder that he was once in the jaws of the lion. Those numbers don’t slow him down when he puts on or takes off his tefilin, all by himself. He, and so many others, have proven that Hitler did not win the war, and that the Jews and Judaism have survived. Several times during the year Mr. S. sponsors tikkun (cake and schnapps) for the shul, commemorating specific days when, we’ve been told, masses of people (actually entire towns), were massacred during the Hitler era. They will not be forgotten. When davening is over for everyone else, you can find Mr. S. still saying some extra tefilos which he reads from a card, straining with those thick glasses which he uses for reading. Those tefilos are not even in the siddur, but Mr. S. says them religiously. He says them for those who need Hashem’s help but who also need the help of others to pray for them. It always takes Mr. S. some time to reach the door, as many in the shul ask him for his blessing. But the real story is what follows. We have another wonderful gentleman who davens in our shul, a man who is much younger than Mr. S., someone still in his 60’s, yet who is already confined to a wheelchair. He is brought in to shul by an aide, often already wearing his talis and tefilin, which the aide had helped him put on. When the davening finishes, Mr. S. approaches this wheelchair-bound ben Torah and gently, oh so gently, takes off the man’s tefilin and then his talis, wraps them both up, and puts them into their respective bags. Only then does he release the man to his aide. All the while Mr. S. is humming a tune, probably taking him back mentally to some time in his past. Having started his day off by praying and helping others, Mr. S. kisses the mezuza and walks out of shul. The world remembers Fidel Castro as a cruel revolutionary, but to Yacob Berezniak [Hernandez], Cuba’s last shochet and kosher butcher, a personal letter from the communist leader has helped him to provide kosher meat to the tiny Jewish community for decades. That Havana has a kosher butcher sounds almost impossible. There are very few Jews left in Cuba. Some say the number is 1,500, the vast majority of which live in Havana. But others claim that there are as few as 500 “core” Jews in the country (Jews who have both a Jewish mother and a Jewish father). Since 1959, when Fidel Castro took over the country, he was bent on eradicating religion. Yet, this one kosher butcher shop has survived, operating with the approval of Castro himself. Adath Israel, Cuba’s only Orthodox synagogue, which is lead by Yacob Berezniak, underwrites the butcher store. The letter from Fidel Castro approving of this kosher butcher store was written back in 1962. Why Castro wrote it is not known. Perhaps, after the exit of some 15,000 Jews who were living in Cuba, Castro felt the need to show everyone that the remaining Jews were being well-treated, something which occurs in Arab lands as well. Once a month, Yacob Berezniak gets up at 2 A.M. to make the 45-mile trip to a slaughterhouse. He slaughters about 60 cows, using only the front half, producing about 2,000 pounds. Yacob drives it all back to the store in his refrigerated van. There is no kosher certification available in Cuba; it is Yacob’s self-certified kashrus. Once in the store, Yacob does the butchering and distributes all 2,000 pounds FREE to the three local synagogues: one each Orthodox, Conservative, and Reform. The synagogues then serve meals daily to the community. One of the bizarre rules the government has instituted regarding the business is that the meat is only for Cuba’s Jews. It cannot be sold over the counter and not given to foreign visitors. Yacob is following in his father’s footsteps. Avraham Berezniak was also a shochet, chazzan and shul administrator. At age 11, Yacob was asked by Avraham to take an oath that he would take care of the Jews of Cuba. He has kept his promise. By age 14, Yacob was chazzan for every mincha and maariv; by 16 he was the shul treasurer.